National Trust – Video Of Storm Damage North Norfolk Coast North Norfolk Sea Defences – Where Do We Go From Here? Samphire – have you ever tried it? How about Morston mussels and Stewkey Blues (cockles)? Kippers from the smokehouse at Cley? Have you ever walked on beautiful Holkham beach? Picnicked at Stiffkey Freshes? No? Then it’s time that you put that sad situation right. North Norfolk has so much to offer its visitors. Come to see us soon. Get away from it all for a weekend or preferably longer and explore North Norfolk. Bring the binoculars, walking boots and your rucksack and stay in one of the excellent hotels, on one of the highly-rated camping or caravan sites or in a Norfolk holiday cottage. If you seek peace and quiet you can walk on the Norfolk Coast Path where all you are likely to hear is the call of the oystercatcher and the song of the skylark, and, if you are very lucky, the boom of the bittern at the Norfolk Wildlife Trust Reserve at Cley. Visit Norfolk beaches – some of the best in the UK. Try the local delicacies – Cromer crab, samphire and fat Morston mussels. Browse the numerous antique shops, galleries and gift shops in the Georgian town of Holt. Sail at Brancaster, water-ski or sail at Blakeney or take some surfing lessons at Cromer. Enjoy the pubs where you will find good food and beer and meet some local characters. Spend an evening at Cromer’s ever-popular end of the pier show. Come at carnival time or experience the Cromer and Sheringham Crab and Lobster Festival – a unique event. 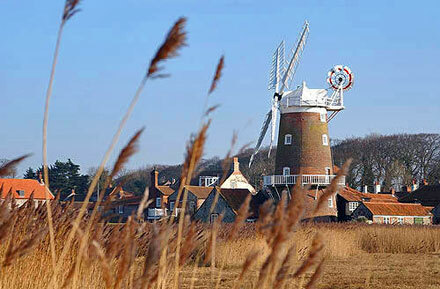 Visit the museums and ancient churches and explore North Norfolk’s fascinating history. If you would like to be kept up to date with the news from North Norfolk, recommendations and suggestions about places to visit, please subscribe to the site. All you have to do is enter your email address on the Home Page. Your address will go nowhere else and you can unsubscribe whenever you wish.